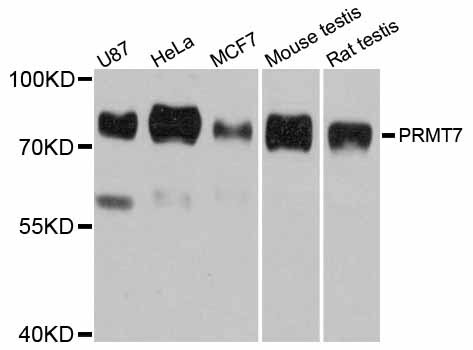 Western blot analysis of extracts of various cell lines, using PRMT7 Polyclonal Antibody. PRMT7, or Protein Arginine N-Methyltransferase 7, part of the PRMT family of proteins, can catalyze the formation of symmetrical dimethylarginine (sDMA) but has a preference for forming omega-N monomethylarginine (MMA). In SNRPD1 (small nuclear ribonucleoprotein Sm D1) and SNRPD3 (small nuclear ribonucleoprotein Sm D3), PRMT7 mediates the symmetrical dimethylation of these arginine residues. This dimethylation is necessary for the biogenesis and assembly of snRNP core particles. Specifically, PRMT7 form H4R3me2s via mediation of symmetric dimethylation of Histone H4 Arg3. PRMT7 is also thought to play a role in gene imprinting, recruiting DNA methyltransferases as various sites, and embryonic stem cell (ESC) pluripotency. PRMT7 Polyclonal Antibody. Unconjugated. Raised in: Rabbit.